Have you been to Shollenberger lately?? Head out and see see the beauty of the park! We have a new banner up encouraging support for our park. Thank you David for your graphic talent and Lisa for the donation of a new banner! Kaye Chandler’s documentary, “It Takes A Community” is a tribute to the power of a community to define its values, express its hopes for a healthy place to live and work, and to fight for this vision. Filmed and edited by Kaye to communicate the knowledge gleaned and action taken by the Petaluma, CA community during the past 4 years as they oppose the powerful Dutra Materials Co. and its allies in County government. Staring straight into the camera, we hear the reasoned, heartfelt, and determined voices of Mayor Pam Torliatt, Vice Mayor Dave Glass, Marin County Supervisor Susan Adams as they outline why Dutra’s Asphalt Plant will be bad for business, bad for housing values, and bad for residents’ health and well being. We hear from ordinary moms, who created an organization Moms For Clean Air, to inform other parents about the health risks this factory will pose to their families. We hear dedicated docents, (who guide schoolchildren through Shollenberger Park, a living laboratory, to learn about stewardship of our environment,) speak out about the inappropriateness of locating a toxic factory in full view of these lessons. Excerpts from the Town Meeting in May 2009 called by Assemblyman Jared Huffman to educate the citizens about the Dutra Asphalt Plant’s ramifications, highlight Alan Pendley, chemist and materials engineer. His testimony on the toxic impact of asphalt by-products like polycyclic aromatic hydrocarbons (PAHs), Hydrogen Sulphide, and heavy metals rejects Dutra’s claims that the plant’s filtering technology is sufficient to protect the town’s air. Longtime environmentalist, David Keller, and community activist and founder of Friends of Shollenberger Park, Joan Cooper, discuss the environmental degradation and dangers that a heavy industrial operation pose to this sensitive and nationally recognized wetlands. Footage of great blue herons nesting, ducks swimming and birds flying in Shollenberger Park and the green vistas of the hillsides beyond are juxtaposed with the grinding engines of diesel trucks at a working asphalt plant and clouds of carcinogenic blue smoke rising from trucks loading up with hot asphalt. Point made. “It Takes A Community” is one more effort to inform the community of what could happen to our park, our families and our future. It’s a call to action to get informed and speak up before its too late.. Don’t miss it. 55 minutes. Check the Petaluma Community Access and KRCB (Rohnert Park) for for schedule or request a copy for your organization. Join us on August 15th for the premiere of It Takes A Community, a documentary by Kaye Chandler. 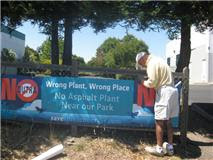 This one-hour documentary details the grass roots efforts to save Shollenberger Park, the Petaluma Wetlands and our healthy community from the Dutra Asphalt Factory. Meet for dinner or just come for the movie! A portion of the proceeds will be donated to the Friends of Shollenberger by the generous folks at the Aqus Cafe. The bench pad has been installed. We will have a Dedication Gathering in January 2017 at the Community Bench site, located on the South loop of the walking path at Shollenberger Park. Check it out! Donations to Save Shollenberger always welcome and needed. 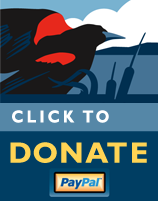 Think of our park and the work we need to keep doing to save it when making your end of the year donations — tax deductible! Click here to watch a video of our Hands Around Shollenberger event! A Benefit for Friends of Shollenberger (O.W.L. Foundation) fund to protect our park. We are a group of ordinary citizens who enjoy open space, clean air, and community well being. We have joined together to preserve and protect Shollenberger Park and the Petaluma Wetlands for all of our families and for future generations. We provide information and a forum for citizens to learn about our local environmental issues and work towards protecting our park. As a “Special Project” of the O.W.L. Foundation, (http://owlfoundation.net/OWL.htm), we are a non-profit organization and donations to support our activities are tax-deductible. This fight is not over! Stay tuned for our next steps in preserving and protecting Shollenberger Park and Petaluma Wetlands, and our community from an asphalt factory at Haystack Landing.